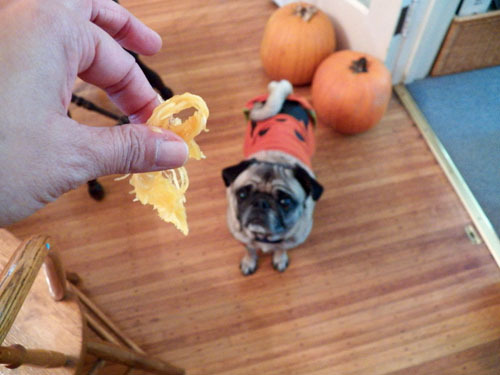 Did you know dogs love pumpkin? Well, mine do at least. Be aware, it's a laxative. I know from experience: don't give it to your dog and then go to work. You will be in for a big cleanup! The squirrels tore into one of our pumpkins, and now our dog alternates between chasing them off and trying to get pumpkin for herself. Ellen - Squirrels completely consumed our jack o'lanterns last year! Squirrel or pumpkin? That is a tough choice for a dog! 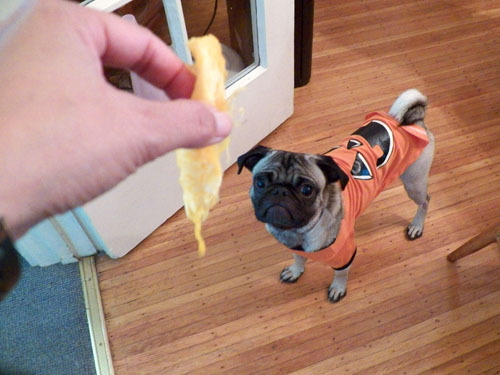 I feed my Chihuahua pureed pumpkin from the can (not the pumpkin pie filling, just the pureed pumpkin). He gets about 2 tbsps when he is feeling a little constipated. I can usually tell by how his tummy puffs out. I give him the pumpkin (he LOVES it by the way) and within two hours he is ready to go. Firesong - that is a great tip.